Fast forward a couple of days — David found a used rear end in Grand Rapids, a city about 60 miles from us. But, when he and Will examined it, they decided the housing was too rusty. David had rebuilt the old one only two years ago, including new brakes & rotors. So they spent a whole day taking the gears out of the new rear end to put in David’s old housing. Ashley and I played “go-fer,” driving for parts. While they were at it, they also welded a sturdy patch on David’s frame, which was very rusted. Will and David spent two whole days rebuilding the rear end of David’s truck. 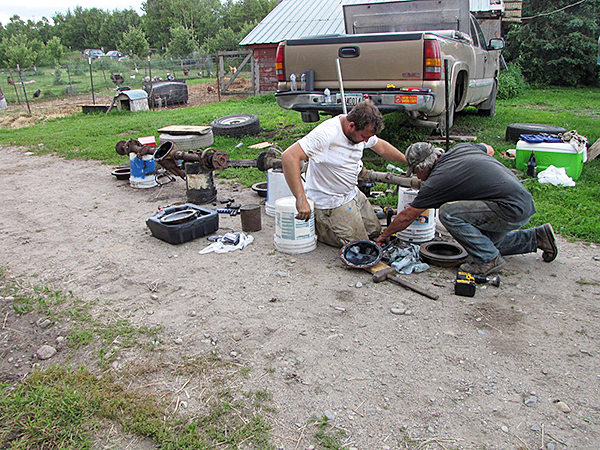 The mosquitoes were bad last night, but David and Will were able to get the rebuilt rear end back in the truck. They didn’t have time to get the tires mounted back on or give it a thorough once-over to make sure they didn’t miss anything. Now Will has two fields of hay down. One is at home and the other about two miles away. We were kind of nervous as they called for a 50% chance of rain yesterday. But we didn’t get any rain. Whew! Today, hopefully, Will can get that hay baled. We need some extra as those bad yearlings are now shut in the training ring with a mama cow with a new calf. 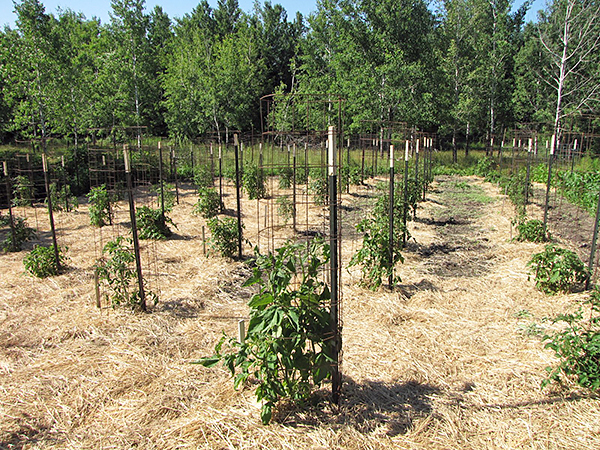 The main garden looks great, despite a cow raid yesterday. The tomatoes are getting huge and are starting to bloom. I am sorry to hear about David’s truck. These things always seem to happen when finances are tight. Hopefully the breakdown happened at home and not somewhere on the road. What a blessing that Will has such great mechanical skills and that David is such a hard-working and conscientious young man. You did an excellent job raising him to be so and these qualities will carry him far in surviving life’s ups and downs. At least you caught the cows quickly but I am sure you didn’t appreciate the extra “surprise” from them. 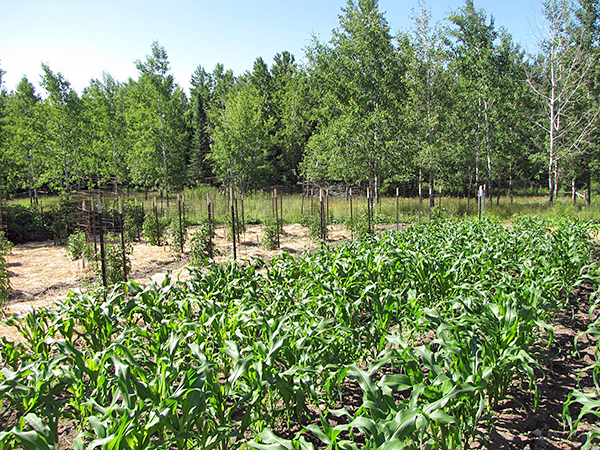 It IS amazing that we homesteaders can tell the difference between a sound out of place and a normal sound, isn’t it? Yeah, cow pies ARE slick, especially in wet grass, wearing moccasins! I’ll admit to a few bad words as I regained my feet, trying not to get my hands or face into the manure too. Yeah, I, too had a laugh after the cows were back out of the yard. Will got the baler fixed but had to stop when rain (which wasn’t supposed to come until 8 PM, threatened). Luckily, we got 100 bales into the barn before it got too wet. Now we’re waiting till the rest dries so it can get baled. Ah, Jackie, what a way to start your day. Isn’t it fortunate that our brains are working as we sleep and register a “moo” that doesn’t belong there! Fresh manure is sooo slick, and impossible to get the smell and stain off the skin and clothes, but in the rush of the moment you just can’t watch every step!! (Sorry, but I did laugh :)) I’m so glad little damage was done in the garden. It is an endless battle keeping wild and tame critters out and you are surrounded by both. I hope you all will get a break and the hay will stay dry, the machinery will run and your garden will continue to thrive. Ya’ll are so fortunate that you can do so many things! Fix so many things!! In times of trouble you all pull together to get things done! What a blessing! Trials make us thankful when everything is going well and running smoothly.